Kitchen cabinets provide a dual purpose in that they can both beautify and improve the functionality of your kitchen. Choose the wrong kitchen cabinets and you’ll be left regretting your most recent project. Get the right ones, and you could have a beautiful kitchen that will last many years into the future. Kitchen cabinets come in many styles, which can make the choice difficult for first time home builders or remodelers. A breakdown of the most popular styles today will help you to make the best choice in the project planning stages, allowing for the smoothest transition from design phase to making use of your brand new kitchen. Shaker style cabinets have remained popular for decades, and for good reason. The design is clean and minimalist but offers just enough three dimensional depth so that a kitchen never looks boring or too angular. Shaker cabinets lend themselves well to painting, even in bold and unconventional colors. Kitchens designed with a summer theme in mind can make excellent use of painted shaker cabinets. Sleek modern kitchens can benefit from shaker cabinets finished in dark wood stains, including charcoal and grey, and open traditional kitchens look excellent with traditional white painted shaker cabinets. The biggest advantage of this style is that costs are kept in check thanks to easy manufacturability. The versatility also means that shaker cabinets can be used in almost any home and kitchen, without looking out of place with the rest of the design theme. 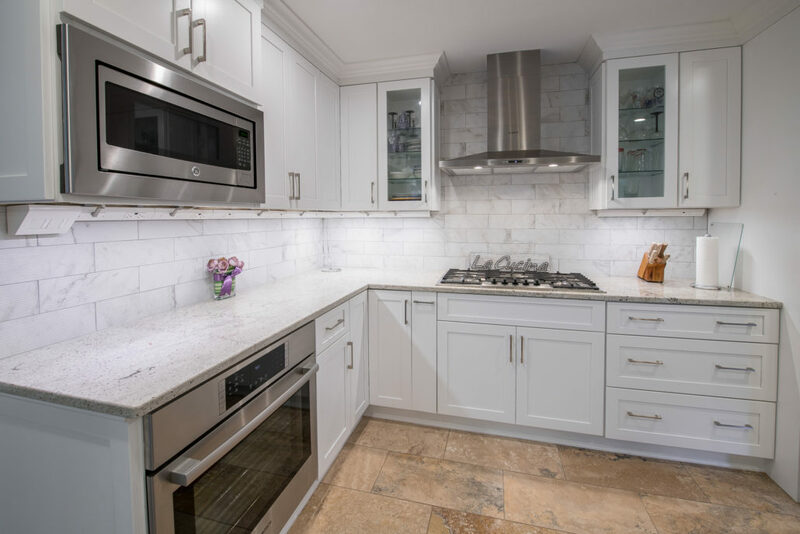 Some might call shakers boring, but when you see the vastly different kitchens that they’ve been installed in, you’ll find that they can be as impressive as any designer custom kitchen cabinets. Louvered cabinets may look traditional at first glance, but they actually work incredibly well with modern architecture and kitchen designs. Wooden louvers are versatile with numerous selection of different wood species and stains. Lighter cabinets can work with open plan kitchens that receive a lot of natural light, whereas darker examples work well in contemporary apartments or kitchens that make use of sharp angular edges and clean lines. Louvers can break up flat kitchen aesthetics to provide a look that blends conservative and creative design elements. Louvered kitchen cabinets may be closed and purely cosmetic, or they could be designed for functional ventilation suitable for food storage. The use of glass on your kitchen cabinetry can add a unique design element, while also helping to increase the impression of space in your kitchen. Glass doesn’t need to be used on every cabinet door, but can instead be used for specific feature cabinets to add accents around your kitchen. Wine cabinets with glass doors allow for easy viewing and selection from your collection, and even pantry cabinets can be designed with tinted glass that will look impressive, while still protecting any perishables from light exposure. Stained glass is another popular option that is often utilized in designer classical kitchens, art deco inspired kitchens, and kitchens that use transitional design to bring the traditional and contemporary eras together. Glass cabinets may require more upkeep with cleaning, but the aesthetic benefits are considered worthwhile by many homeowners. Both flat and inset cabinets are also popular with homeowners, with inset designs being slightly harder to produce and sometimes coming at a premium price. Inset can allow for a clean seam between all cabinets, and quality carpentry can make these feel luxurious. The problem for some is that inset cabinets may feel too traditional, but that depends on personal taste, and also the finishing method that is used. As with all cabinet choices, there are no real rules to how you use either flat and inset cabinets. If none of these cabinet options connect with your sense of style, or if they simply don’t work with your home architecture and interior design, then it’s possible to have custom cabinets made. Going with custom cabinets will add to the cost of your kitchen remodel, but the results can leave you with something truly unique in the heart of your home. Custom cabinets can incorporate elements of the most popular styles, or they could be completely original. Corrugated galvanized steel has been used in modern kitchen cabinets, particularly in remodeled apartments or rustic homes. Large warehouse style apartments can combine perfectly with corrugated steel panels over cabinet doors, and the industrial look provides a surprisingly attractive aesthetic. Other options could include combining louvers or shaker cabinets with glass, or you could even choose manufactured Thermofoil cabinets. Thermofoil is inexpensive, waterproof, and can be styled to imitate natural wood grain. If you’re concerned about the impact that humidity could have on your kitchen cabinets in Austin TX., then a manufactured solution like Thermofoil will leave you confident in the longevity of your investment. A kitchen that is truly yours, is one that is based off of your vision. By talking to the team at Kitchen Central in Austin Texas, you can discover all of the options available for your home and your budget. We’ll never push you towards a design or material based on trends or conventions, but will instead give you the information that you need to make a decision that is true to your vision. With an in-home consultation you can begin to visualize what your kitchen will look like after remodeling, and you’ll enjoy the convenience of having the project managed from conceptualization through to material selection and installation, all the way to the final walk through of your new kitchen.